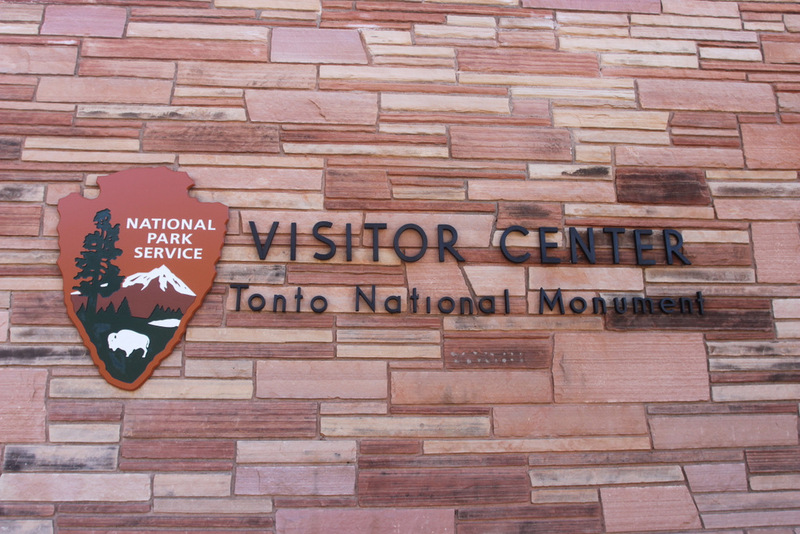 One of my favorite places to take family and friends when they visit is Tonto National Monument. With a drive-time of a little less than two hours from Phoenix, it’s an easy day trip when you want to see a bit of history, and the Sonoran Desert. Tonto National Monument is an absolutely fascinating place with great views of the desert valley below, and Roosevelt Lake. If you’ve ever wanted to see real indian cliff dwellings, go here! 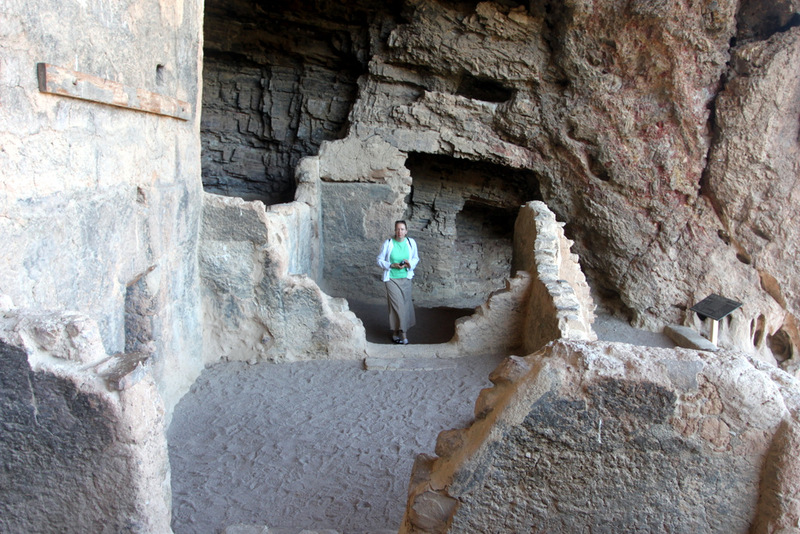 The cliff dwellings are beautifully preserved and you can literally walk inside the ruins. These cliffs were occupied during the 13th, 14th, and early 15th centuries by indians who farmed in the Salt River Valley. There’s a visitors museum at the base of the mountain, with a tour you can take to see examples of the pottery and textiles they’ve found on the site. Tonto National Monument was first listed as a Historical Place on October 15, 1966 and then listed again as archeological sites in 1989 — rather recently! 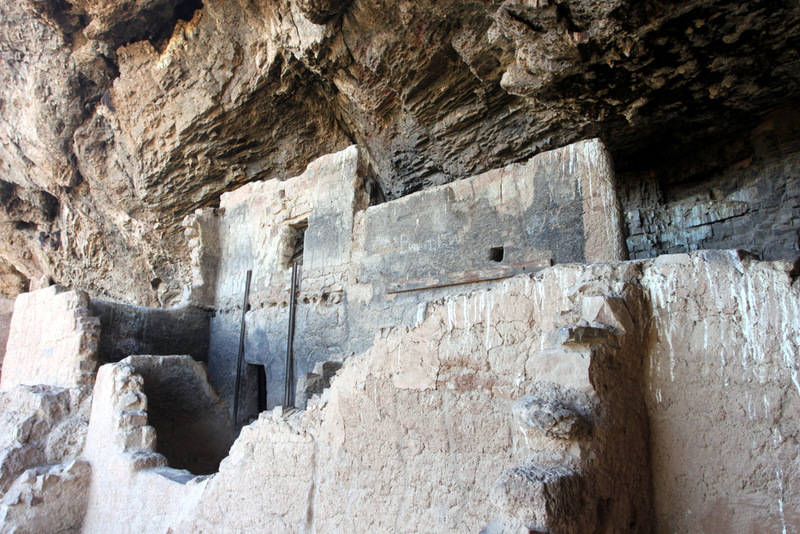 The Salado Indians constructed the cliff dwellings you see today at Tonto National Monument. The hike to see the Lower Cliff Dwelling is only 1/2 mile in length (but a fairly good incline, but since it is paved, it’s not that difficult). The trail bends back and forth, so it doesn’t get too strenuous. Even people who don’t like hikes should be able to do this one! Along the pathway you’ll see beautiful scenery and have many wonderful opportunities to take photos of the landscape. I’ve captured so many amazing photos of Saguaro cactus, and Roosevelt Lake from the pathway. Once you reach the top, you’ll be able to walk among the walls of the indian ruins, and walk where the indians once lived. You’ll be able to see there living spaces, and imagine life 600-800 years ago. The park typically has a Park Ranger on-site ready to answer any questions that you have. Most visitors only see the Lower Cliff Dwellings because of time and limitations, but if you plan ahead and make a reservation, you can see the Upper Cliff Dwelling. 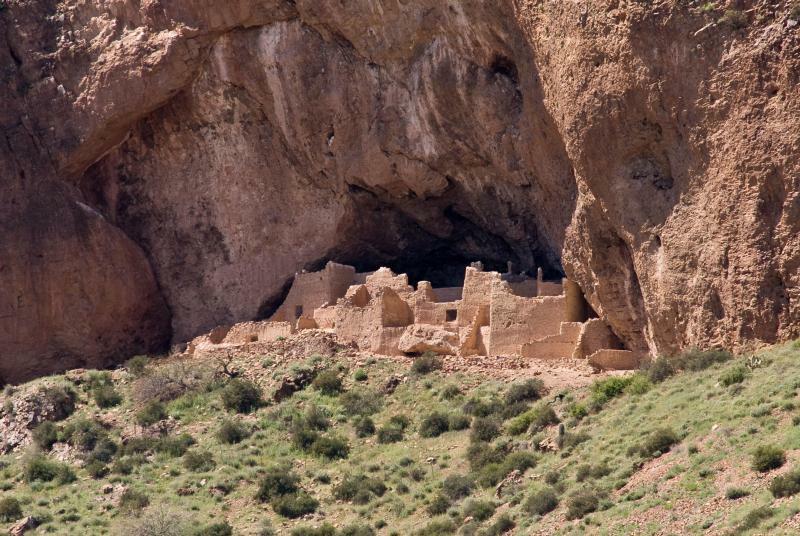 The Upper Cliff Dwelling is a 40-room dwelling built around 1300 AD. It is a larger dwelling, and not even half of the visitors to Tonto National Monument even see it. Experts believe the basin was abandoned some time between 1400-1450 AD and remained mostly untouched since then. 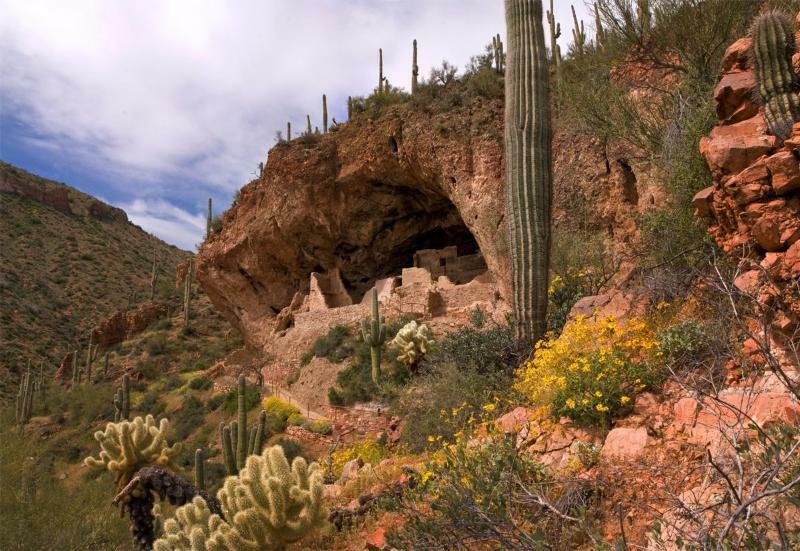 The Upper Cliff Dwelling trail is open from November through April, and requires a reservation. The hike is 3-miles round trip. You’ll need to call for more information and to make your reservation. Call 928) 467-2241 for more information. 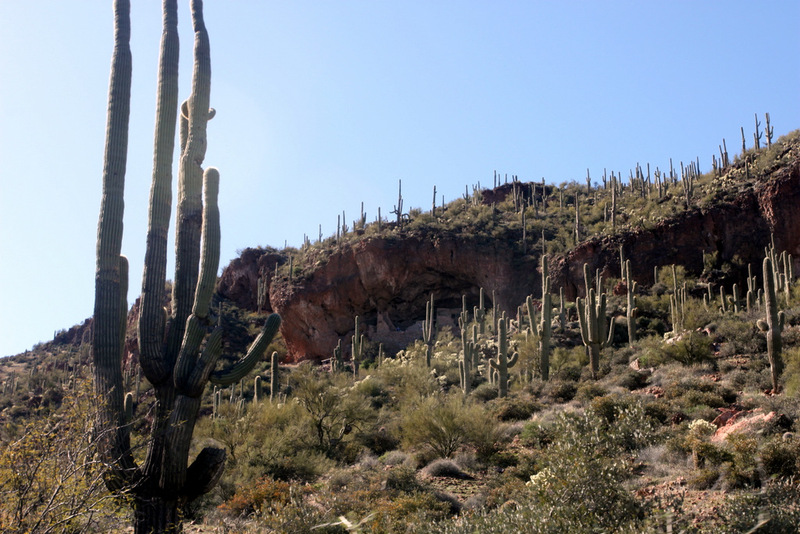 There are actually three ways to get to Tonto National Monument. The shortest, is to take Shea Blvd. through Fountain Hills, and then take the 87 North until you reach the junction for 188. Another way, is to take the 60 East until you reach Globe, where you can then turn North on 188 towards the monument. If you are really adventuresome, try taking The Apache Trail (long dirt road) and exit the 60 in Apache Junction and follow the signs towards the Apache Trail. 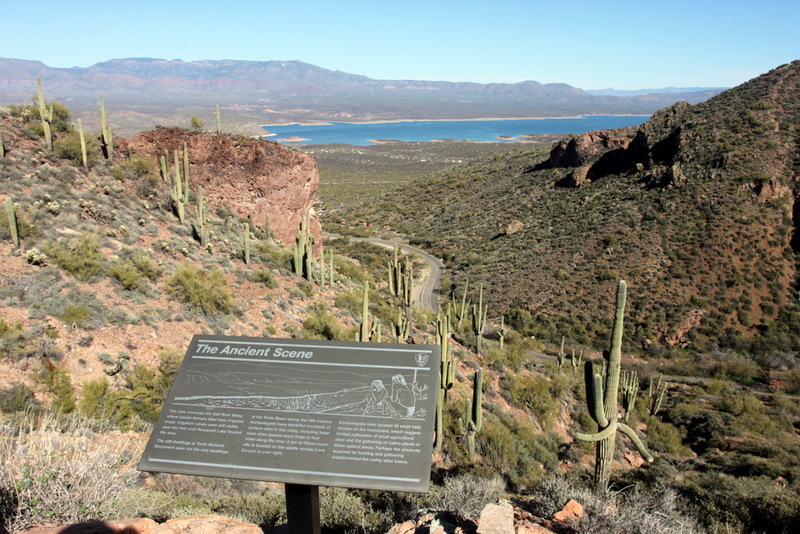 The trail ends at Roosevelt Lake, and you can hop on the freeway a short distance to the monument. Personally, I prefer to make a day of it. We’ve taken the southerly route many times, and we stop for lunch in Globe, then continue to Tonto National Monument. After hiking at the monument, we normally head home by heading North on 188, and going home through Fountain Hills. If you do choose to take the Apache Trail, you’ll want to stop in Tortilla Flat, which is a town about halfway to Roosevelt Lake. Also, the paved roadway ends just a few thousand yards from Tortilla Flat, if I recall correctly. The park allows leashed pets up to the Lower Cliff Dwelling. There are bathrooms and water fountains in the visitors center, but not at the top. The fee to enter the park is $3 per adult, and children under 16 are free. They accept credit cards, as well as cash. 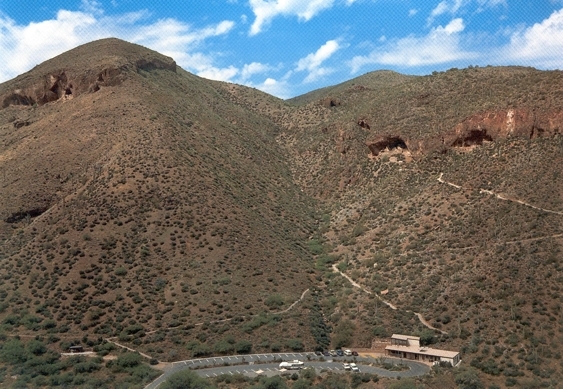 There is currently no additional fee for tours to the Upper Cliff Dwellings, so get a reservation! The park is open daily from 8 am to 5 pm, except Christmas Day.